The Oscars, taking place in Los Angeles on March 2nd 2014, are the meeting place of Hollywood royalty. But while real royals might have some of the best stories in town, it's rare for a regal role to win a king or queen of the big screen the ultimate prize - an Oscar. In the eighty six years of the Academy Awards, just a dozen or so royal roles have led to an Oscar win. And with no kings, queens, princes or princesses among the parts nominated this year, it will be another year before any chance of an extra royal joining the list. Here are the royals whose lives have landed their stars an Oscar. The decision of Madeleine of Sweden and Chris O'Neill to name their daughter, Leonore, has turned the name - and its variants - into one of the most popular royal monikers around. Leonore is another version of Eleanor and in less than ten years this once forgotten regal name has enjoyed a resurgence that has seen it invade just about every royal court in Europe. While the name may be rare in Sweden - the princess shares her name with just 128 of her fellow citizens - in the royal houses of the 21st century it's hard to get past go without passing an Eleanor. She has been a queen for almost forty years but for a moment, Silvia of Sweden was a grandmother first. In a photo released to mark the official naming of her second grandchild, the Swedish consort is seen beaming with pride as she holds Princess Leonore, Duchess of Gotland in her arms. No crown, no throne, no robes but a huge smile that shows even queens fall in love with princesses. Her Royal Highness Princess Leonore Lilian Maria of Sweden has made her debut. Little Leonore, born to Madeleine on February 20th 2014 in New York, has been seen for the first time in a photo released to mark the official announcement of her name. As is traditional for the Swedish Royal Family, special ceremonies had to be observed for the naming of its latest member. King Carl XVI Gustaf told his country's cabinet about the arrival of its newest princess, informed them of her name and full title and only then could the rest of his fellow citizens be told. King Willem-Alexander and Queen Maxima of the Netherlands seemed to love every minute they spent at the Winter Olympics in Sochi so it's no surprise that they are keeping the flame of the Games alive back home in The Hague. Today the king and queen held a reception for the winners of the twenty four medals their country brought back from Russia. 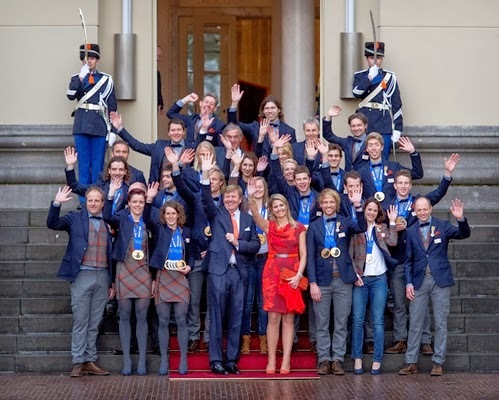 Willem-Alexander had presented one of the eight gold medals won by his fellow citizens as well as one of the bronzes and Maxima had cheered plenty of winners from the stands. And today they sealed the celebrations with a right royal reception and kept the Olympic spirit alive just a little bit longer. The decision of the Queen's granddaughter, Zara Phillips, to show off her baby girl in a photospread in Hello magazine has raised eyebrows. Zara's brother, Peter, famously sold his wedding pictures to the magazine and received quite a bit of stick as a result. 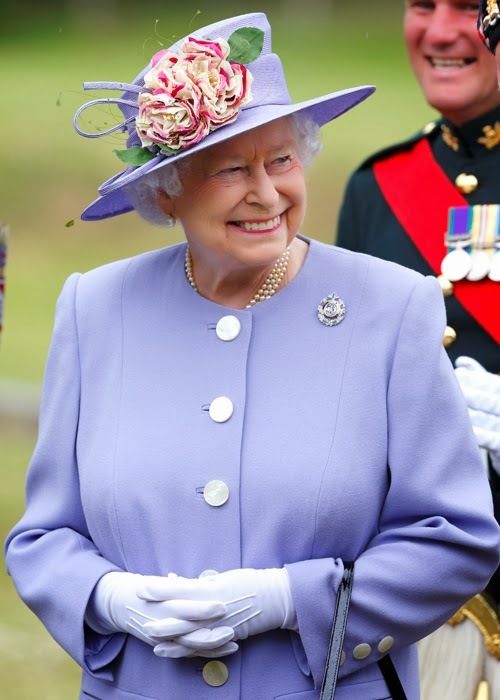 Questions were raised about the fact that the photos, for which Peter received around £500,000, included images of other members of the royal family and it was reported that the Queen was not overly amused. 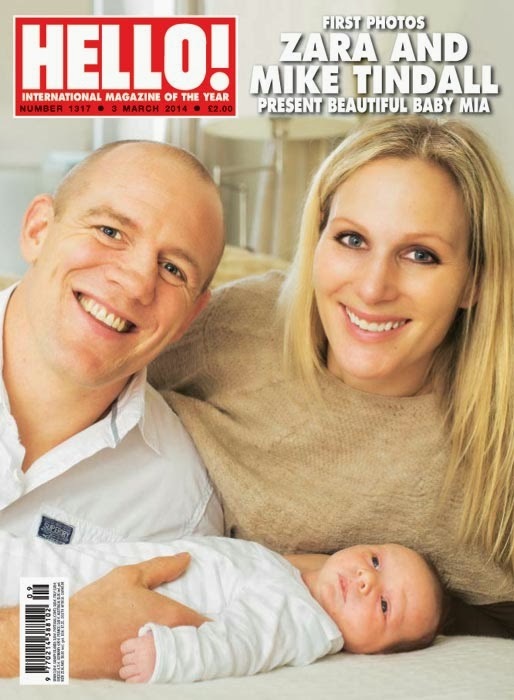 Zara Phillips' decision to show her little girl off in Hello doesn't involve any other member of the royals but it has led to some criticism. The new princess of Sweden is fifth in line to her country's throne and unlikely ever to occupy it. And that she has in common with the other princes and princesses who find themselves at number five on the countdown to a crown. While she waits to meet the cousin who will no doubt turn into a playmate, Princess Estelle has kept herself busy posing for photos to mark her second birthday. The future queen is looking very grown up as she marks her milestone and mum and dad are fading into the background as the little princess takes centre stage. The princess is also seen painting before settling on a sofa at the Haga Palace for a very smart portrait to mark her big day. The little girl who was famously shown off by her parents for the first time in a car seat on their way home from hospital in February 2012 is now queen of the photoshoot. Princess Madeleine kept to tradition to announce the birth of her baby girl but the royal Facebook fan was back to social media for the first photo of her daughter. As the princess and her husband, Chris O'Neill, took their baby home the posted a picture on Facebook of the proud family complete with Sweden's newest royal safely tucked up in her car seat. The photo is reminiscent of the famous first photo of future queen, Estelle, who was shown to the world for the first time bundled up in her car seat on her way home from hospital in February 2012. 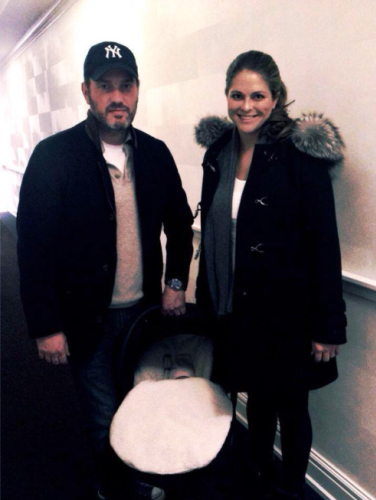 Princess Madeleine of Sweden gave birth to a daughter on February 20th 2014. The little princess was born in New York at 22:41 local time and her father, Chris O'Neill, revealed at a press conference the following day that she had weighed 3.15 kilos at birth and was 50 centimetres long. The official announcement of the birth was made by the Marshal of the Realm and the baby's name will be revealed by King Carl XVI Gustaf at a cabinet meeting. 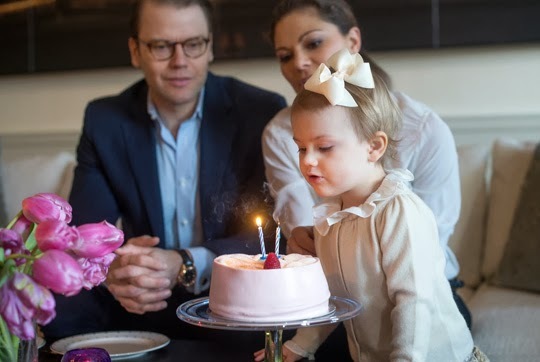 Princess Madeleine and her daughter, who are both reported to be doing well, were visited by the king and Queen Silvia on February 21st after they flew out to America on hearing the news of the arrival of their second grandchild.